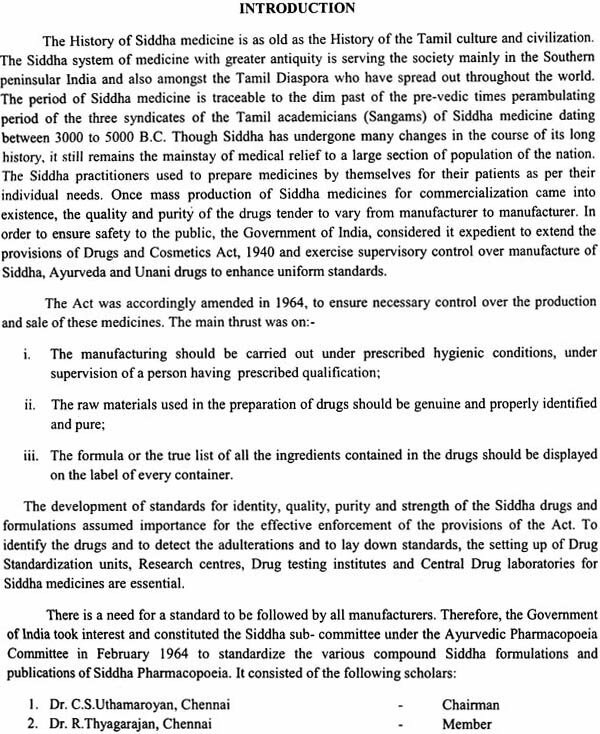 The Siddha Pharmacopoeia of India, part-I, Vol.I is a legal document of standards for the quality of Siddha drugs and substances included therein (Under the Drugs and Cosmetic Act, 1940). 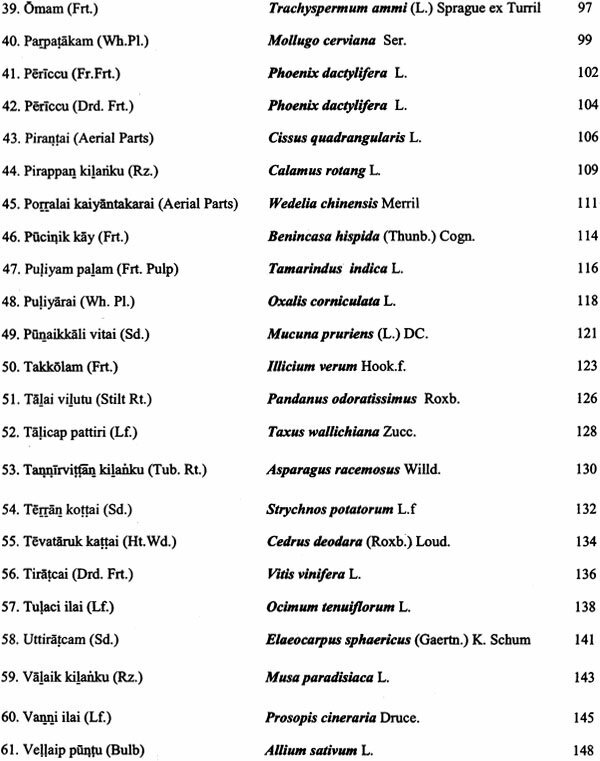 The first volume contains 73 monographs dealing with Pharmacognostical, Chemical and Siddha standards of the plant drugs used in Siddha. 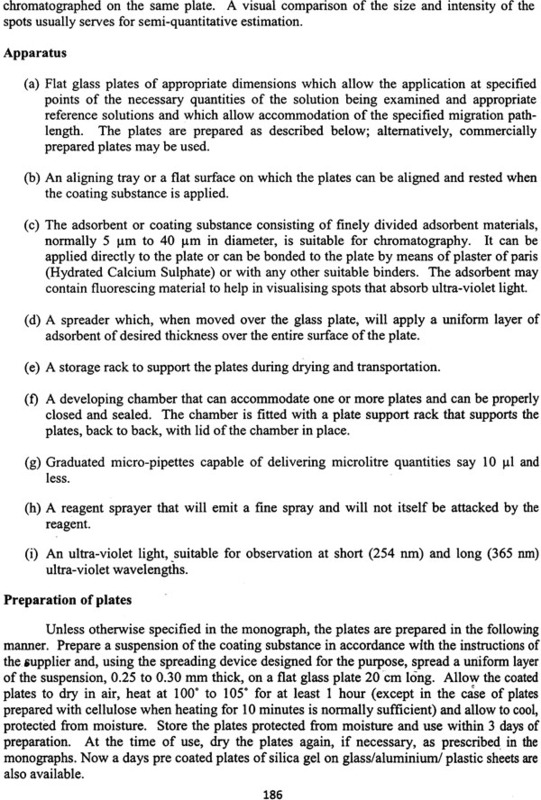 Each monograph describes macroscopic, microscopic characters along with the permissible limit of foreign matter. 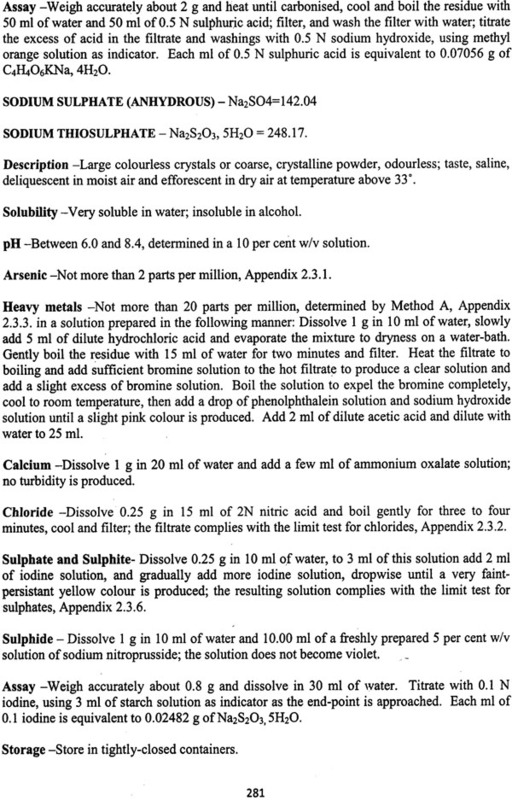 Chemical standards of identity, purity, and strength have been developed based on parameters like Total ash, Acid insoluble ash, Alcohol soluble extractives, water soluble extractives, etc. 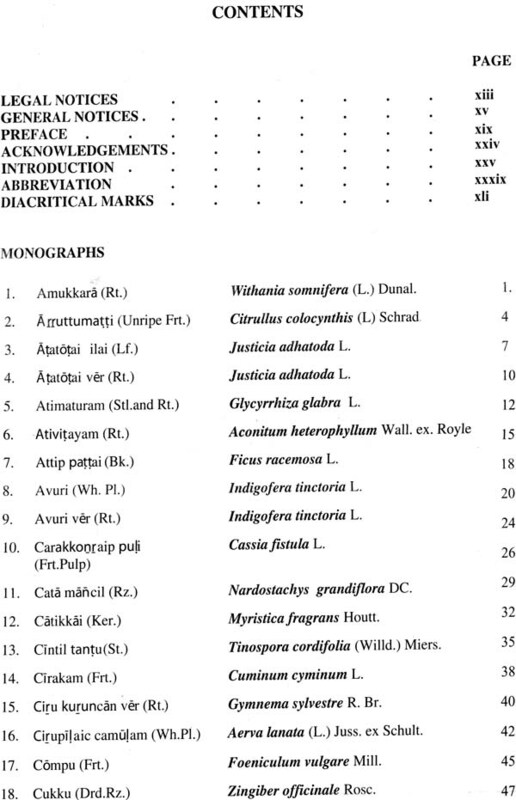 with the references of important constituents present in it. 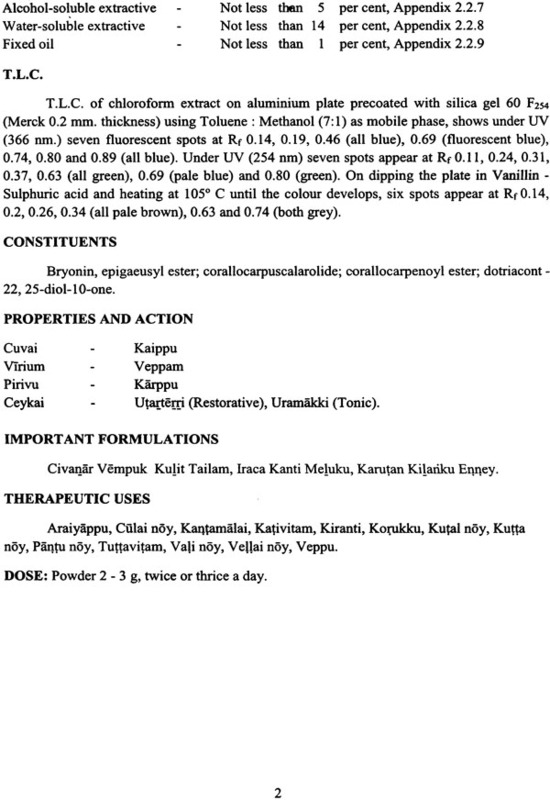 Cuvai, Gunam, Virium, Pirivu and Ceikai based on description of classical Siddha texts along with important formulations as referred in Siddha formulary of India with its therapeutics uses and dose. 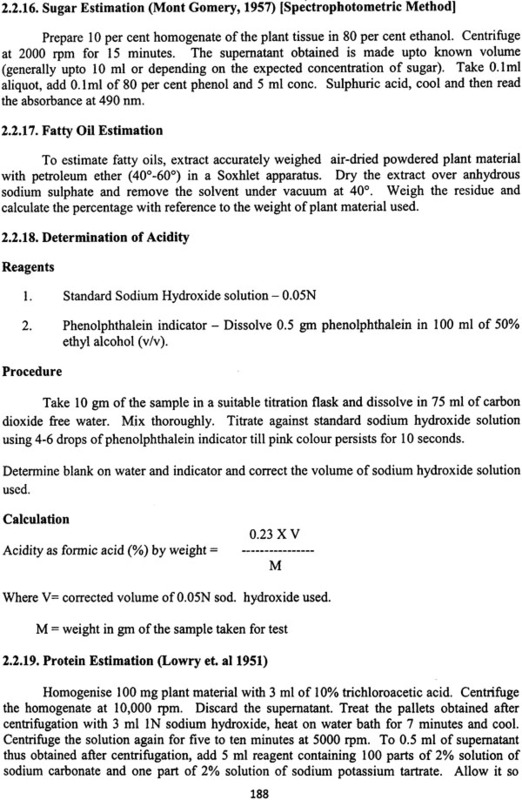 The work on various monographs on all parameters has been carried out at Pharmacopoeia I Laboratory for Indian Medicine (PUM), Ghaziabad (which is a subordinate laboratory of Deptt. of ISM&H, Ministry of Health & Family Welfare, Govt. 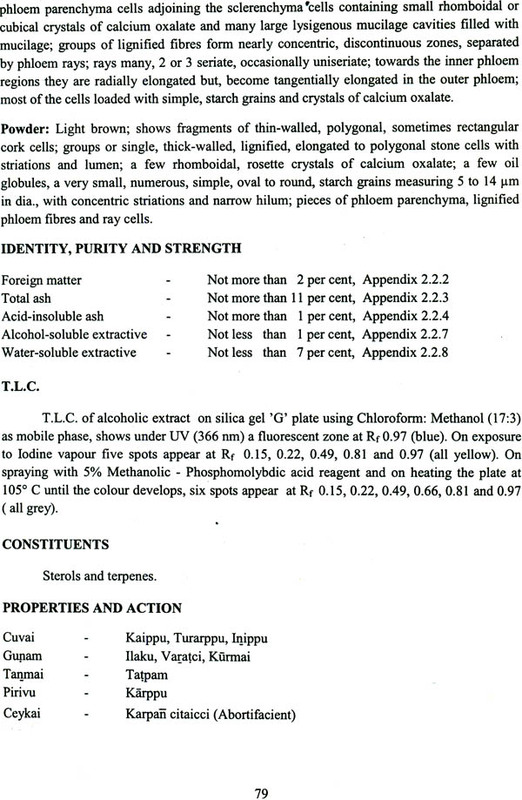 of India) and approved by Siddha Pharmocoppeia committee after careful deliberations by its eminent scientist members. 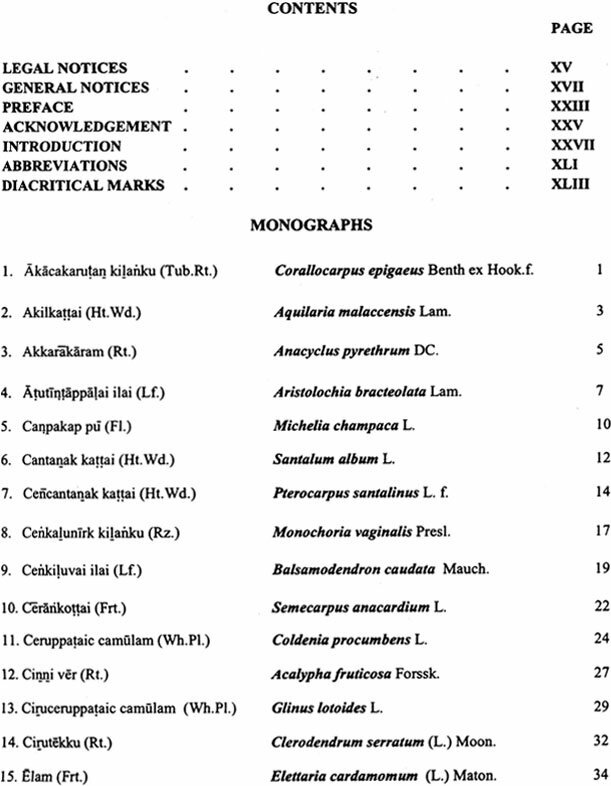 Contents of the volume consists legal notice, general notice, preface, introduction and detailed description of monographs in alphabetical order for seventy three medicinal plants of prime importance used in Siddha. 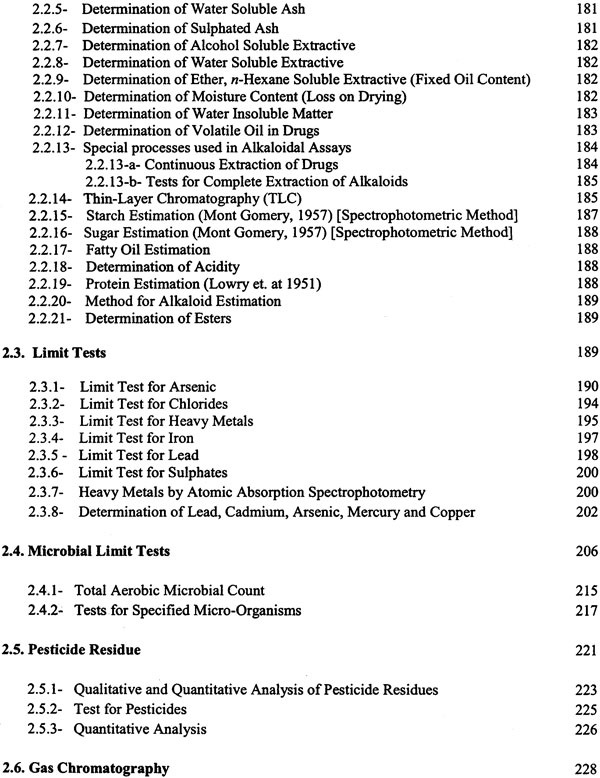 The details of apparatus required for tests and assays are given in Appendix 1 and testing method, determination of quantitative data of vegetables, limit test are mentioned in Appendix 2. 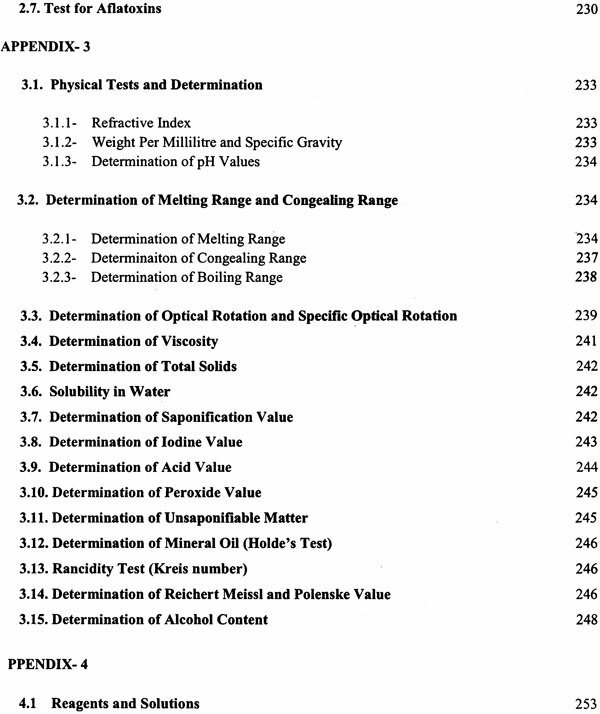 Physical test and determination, reagents and solutions are covered in Appendix 3& 4, respectively. 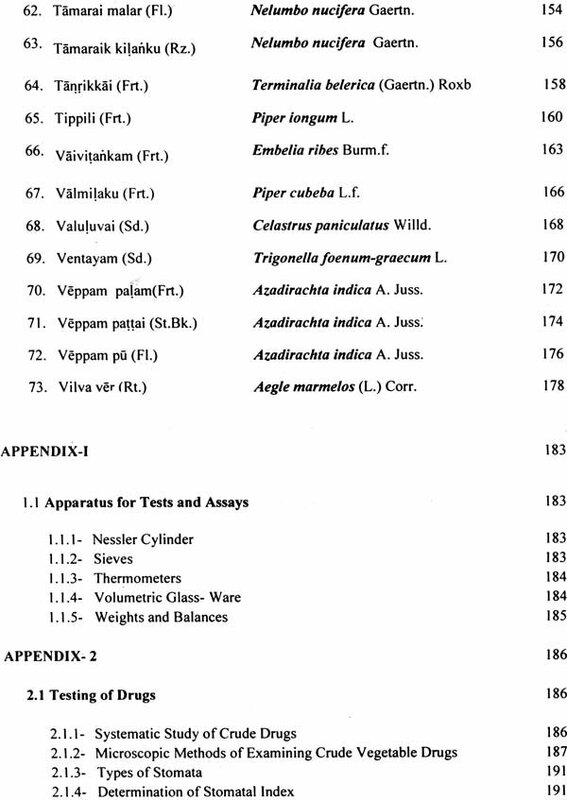 General information, weight and measures, approximate equivalents of doses in Indian and metric system are mentioned in Appendix 5 and 6 which is followed by classical references in original under Appendix 7. 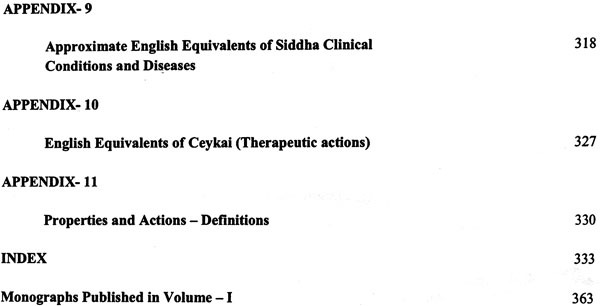 Approximate English equivalents of Siddha clinical conditions and diseases and English equivalents of Ceikai (Therapeutic actions) are mentioned in Appendix 8 and 9 respectively. Properties and Actions are covered in Appendix 10. 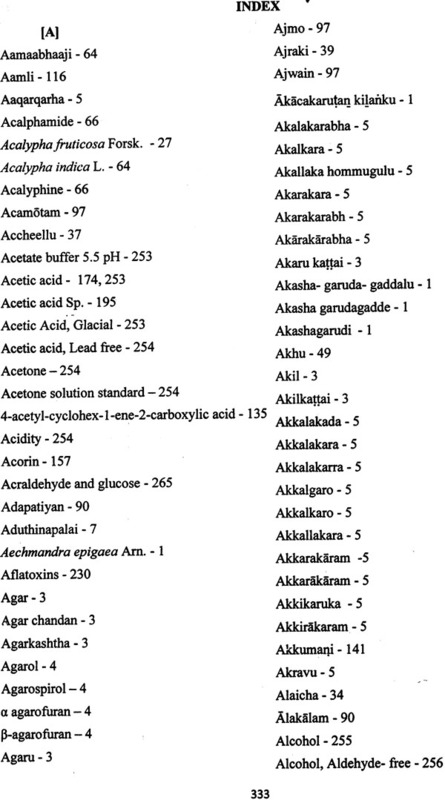 This book is user-friendly for scientists involved in quality testing of drugs, Siddha teachers of Gunapadam, Research scholars, Physicians, Students of Siddha and many others who have interest in quality of Siddha medicines. 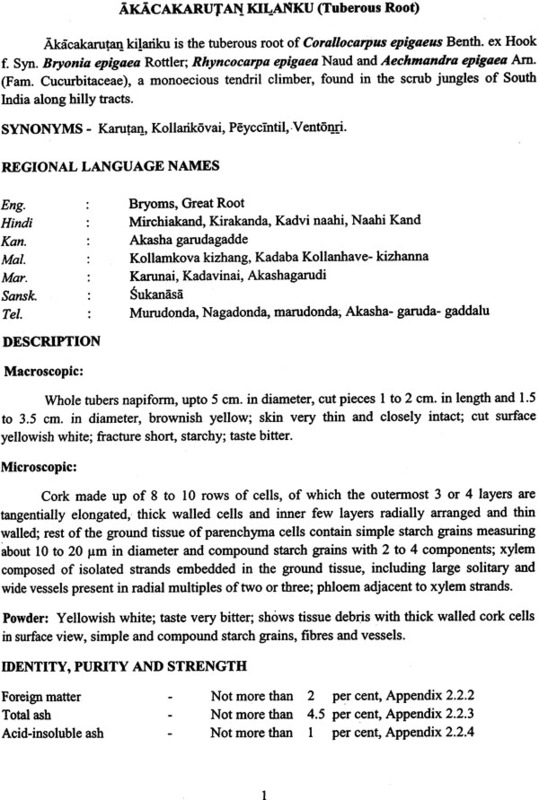 The Siddha system of Medicine is a practice of Arts and Science, the citadel of medical Systems. It was propounded by Lord Siva as a scientific and spiritual benevolence to his disciples. It is a by product of spiritual ascendance aiming the union on microcosm with macrocosm. 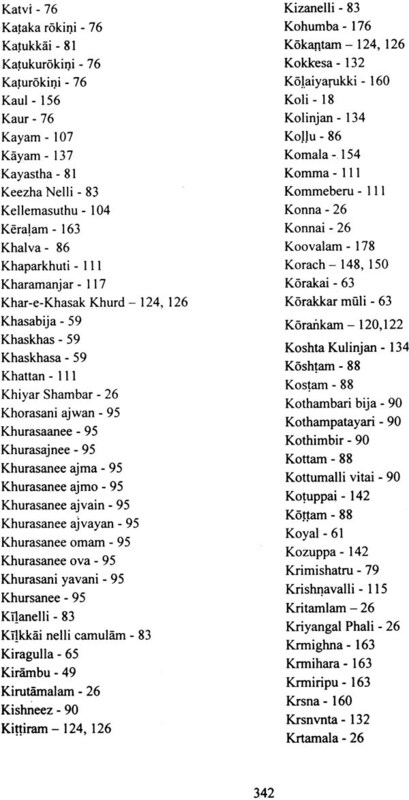 The system was woven into a discipline of reputation by symphony of eighteen Siddhars namely Thirumoolar, Ramadevar, Agathiyar, Edaikadar, Tanvantri, Vanmigar, Pambatti Siddhar, Kamalamuni, Boganather, Konganar, Kuthambai, Siddhar, Pathanjali, Nandidevar, Karuvurar, Machamuni, Korakkar, Chittamuni, Sundarananthar. India is a country of rich traditions and culture. The requirements of people were more oriented to abstract things of life rather than the material ones. Joy, happiness, peace were the main objectives sought for, by the ancient men and thus the astanga yoga of pathanjali sprouted. During this spiritual pursuit, the mind and body are to integrate. However, the practice of this astanga yoga may lead to unforeseen physiological changes leading to pathological manifestations. 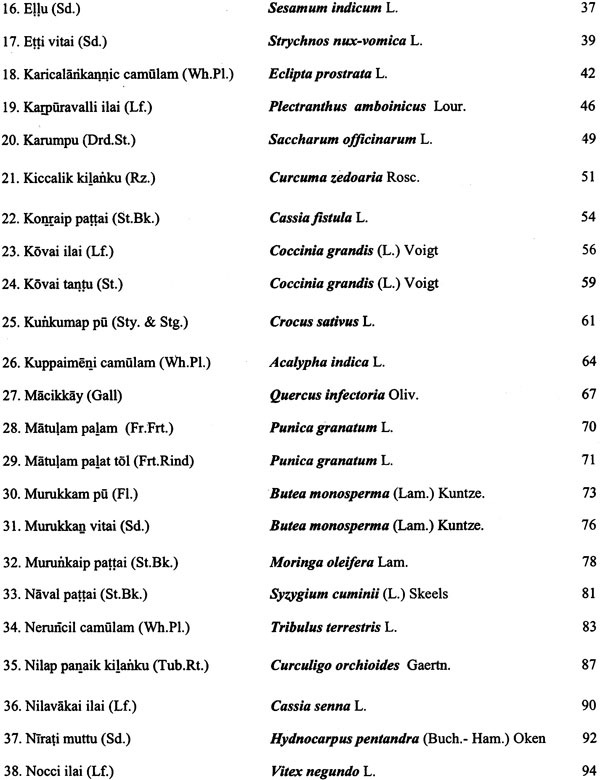 This had led to the discovery of diseases and the sources for the treatment of such diseases. This is in essence the genesis of Siddha system of medicine. The aforesaid eighteen siddhars practiced various specialized arts in Siddha medicine. Again, this had resulted in alchemy meant for the preparation of long acting, potent, high-tech medicines for the treatment of incurable diseases. 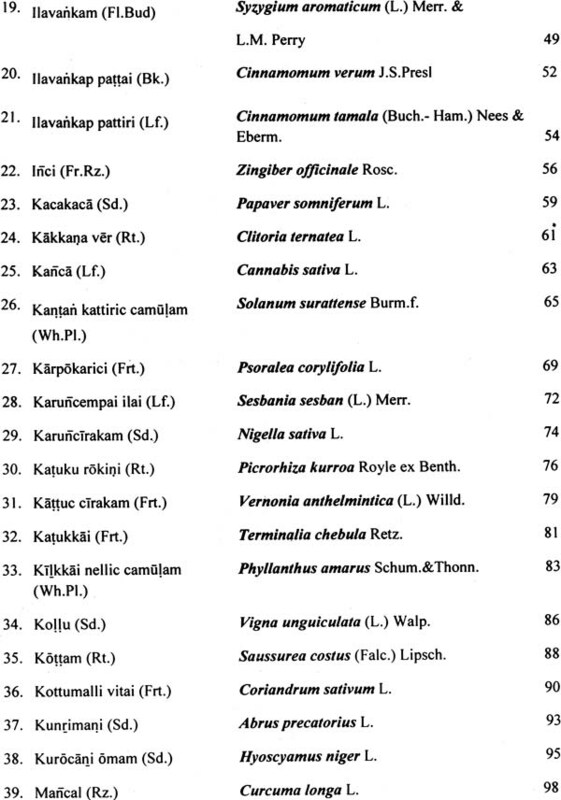 A few others practiced exclusively herbal components as a source of nutrition, medicine and food, thus testifying a plant with medicinal property as herb. Further, for the management of a few clinical conditions a long acting potent mineral were also transformed into medicines. In brief, Siddha System envisages the use of herbs, minerals, metals and as a matter of fact any organic material available in the universe. 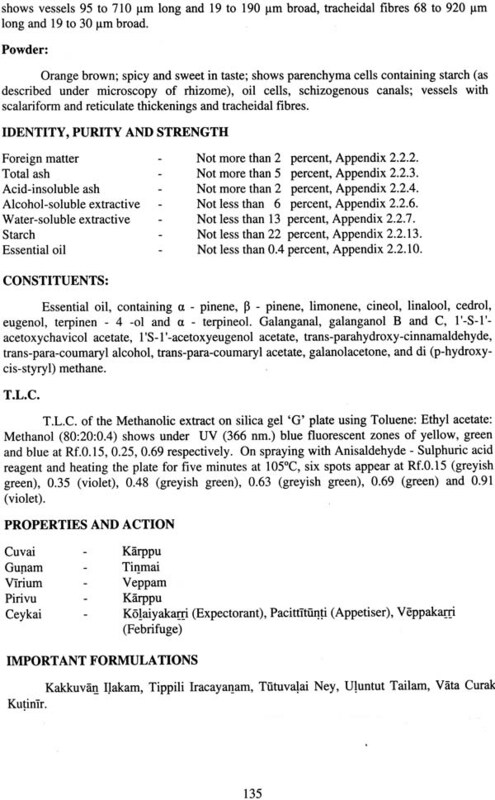 The Siddha system of medicine is unique and is perpetuating for centuries because of its merits. The basis of this system is that, innumerable clinical trials were conducted by various Siddhars during different phases of human history and existence. 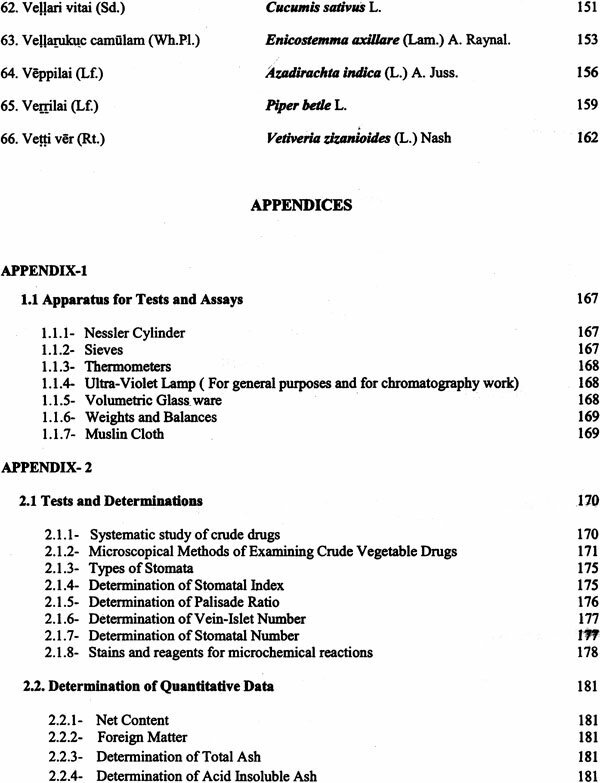 This singularity in preparation, indication for diseases the observable therapeutic outcomes are matching with established allopathy counterparts meant for various diseases. 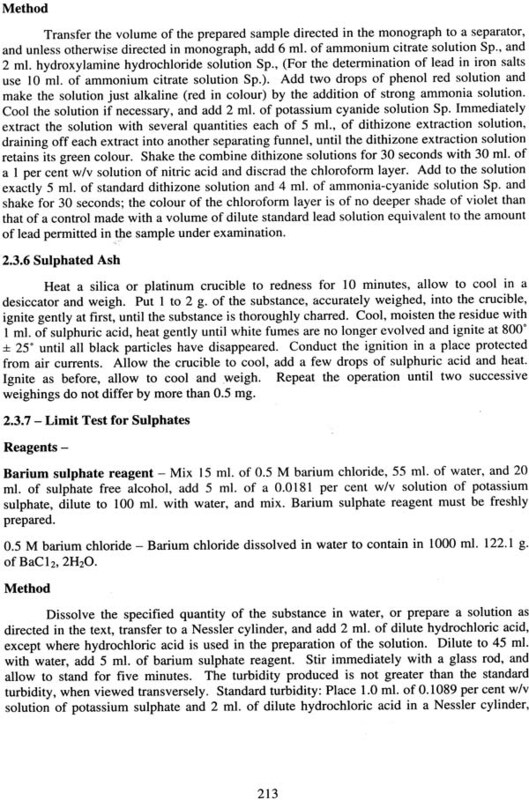 Siddhar's knowledge of Iatro-chemistry, minerals, metals and plants were stupendous. 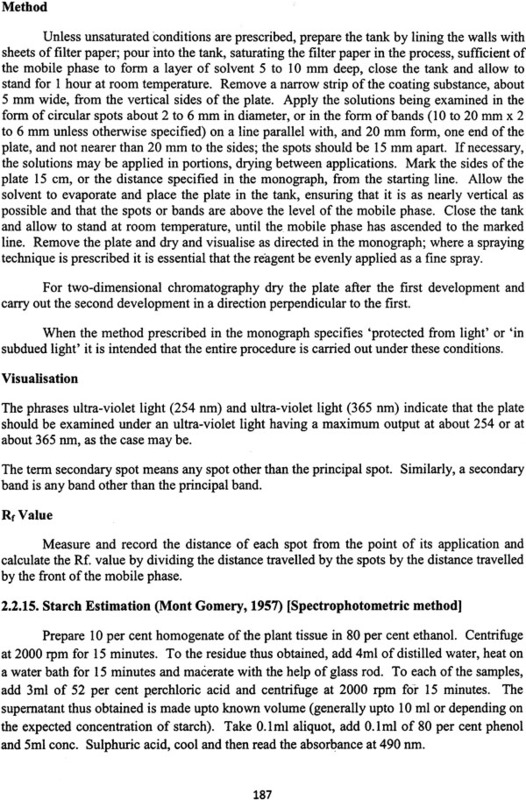 This was successfully used by them from time immemorial. 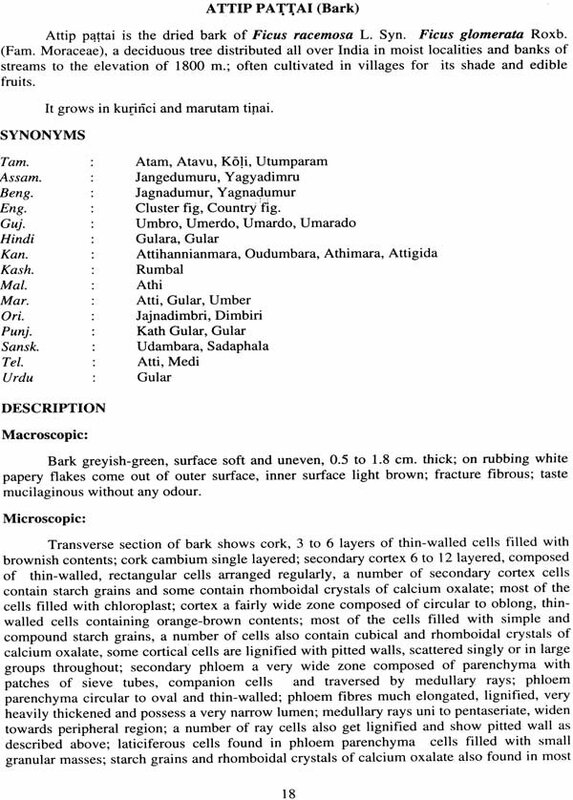 The processes like calcinations of mercury, minerals and metals and the preparation of a super salt known as 'Muppu' animated mercury pills with high potency possessing marveling properties of transmuting metals. 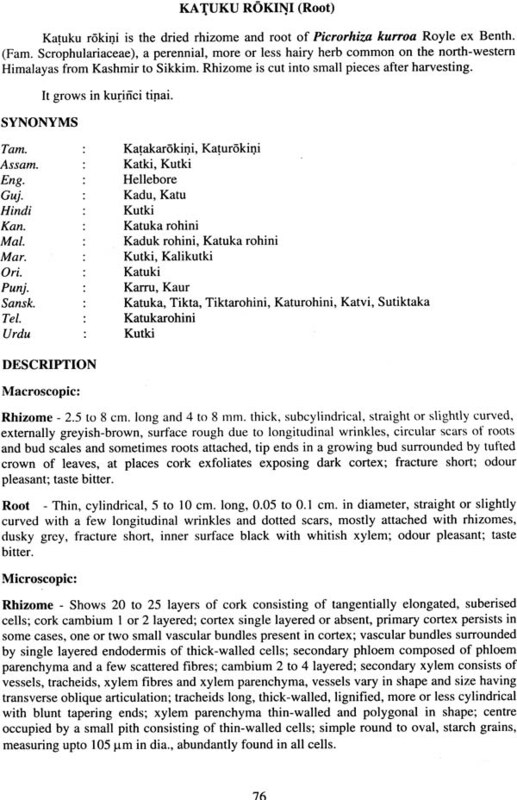 Methods of preparation described for certain rare and efficacious Siddha Parmaceutical forms such as Kattu, Kalanku, Chunnam, Muppu etc. 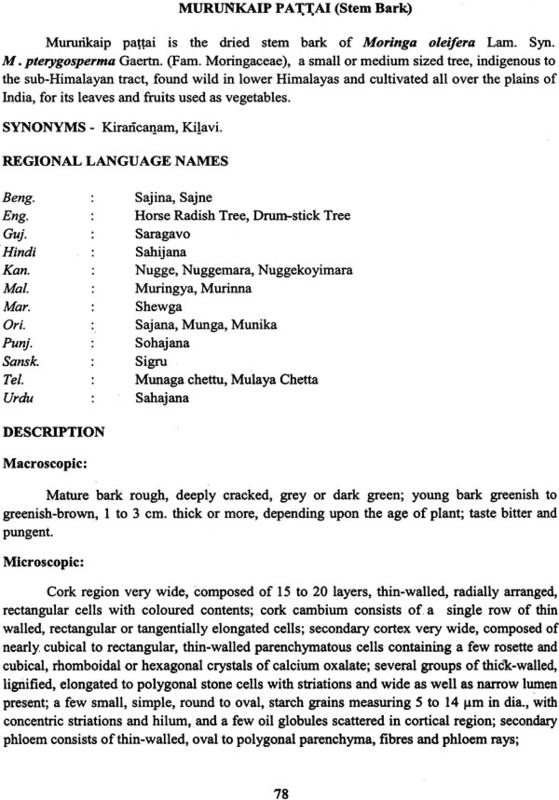 are unique to Siddha system of medicine. These medicines are capable of rejuvenating the entire human system, bearing testimony to the fact that, even in the remote past when knowledge in the chemical technology was not fully developed, Siddhars had unparalleled knowledge in medicine, including the knowledge on various branches of medicines such a Anatomy, Physiology, Pathology, Pharmacology, Biochemistry, Microbiology, Veterinary (Mattu Vagadam), Forest Science (Malai Vagadam), Astrology, Astronomy etc. 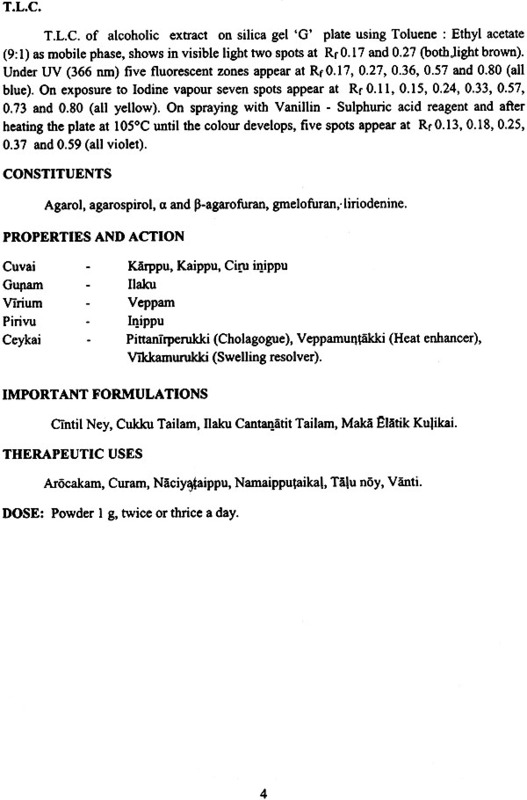 As already mentioned, Siddha medicine is an intuitive system of medicine borne out of wisdom. Therefore, nature is seeding this System. 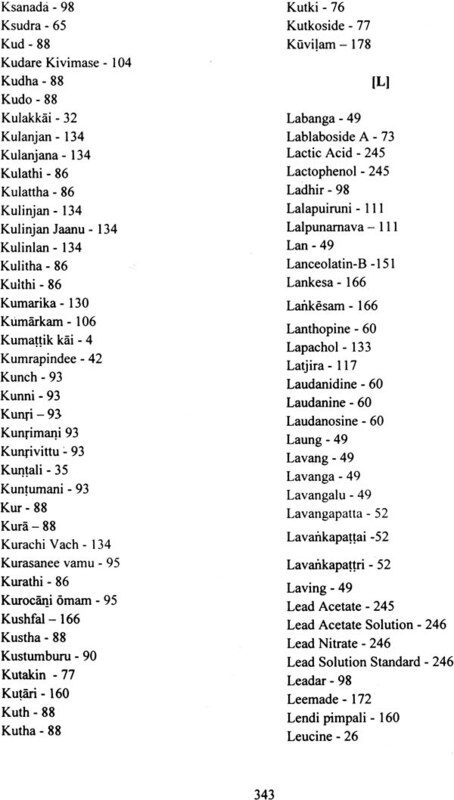 The plants in and around the hills were exploited for the curation of maladies originating near hills and hillocks (Kurinji). 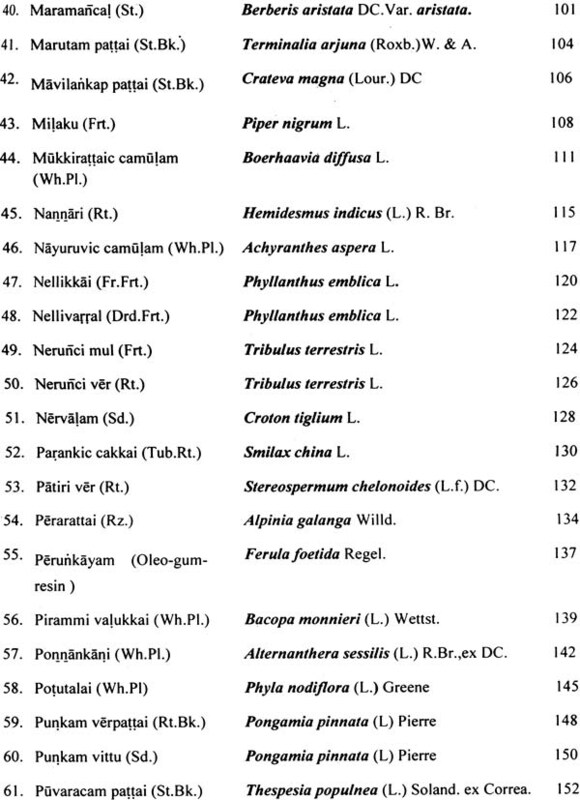 Similarly, small animals, the contents of sea animals were employed for curing diseases of inhabitants on the seashore and its neighborhood (Neythal). The diseases of inhabitants on the plains and the inhabitants on the shores of rivers -w~~e treated with available herbs and herbs minerals in the plains a well as on the shore of rivers (Marutham). 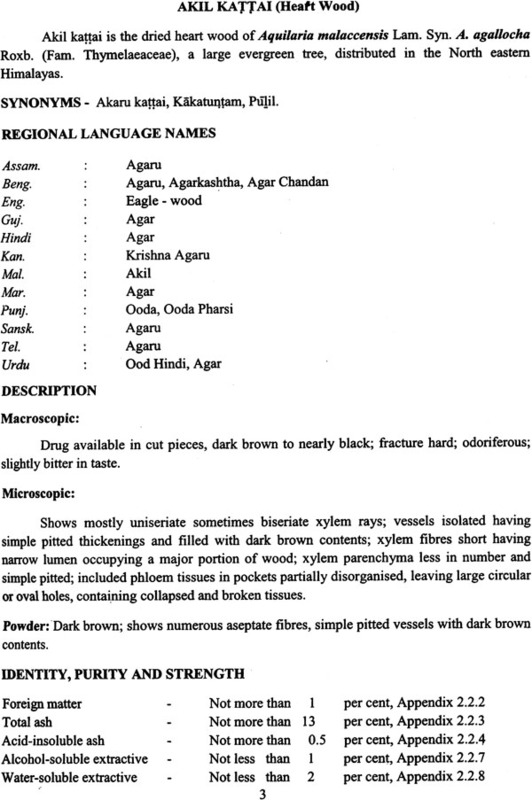 Thus, the system is unique and unsurpassing in that the herbs available in the hills and hillocks were employed for the treatment of diseases of that area without mutating the culture, traditions and habits of the place and of the people. Then alone the patients will be comfortable with the medications. For ego a person in the seashore is adapt to sea food which is not normally relished by inhabitants of plains (usually they are vegetarians). Therefore, Siddhars evolved a system of regional therapy with a geographical ignificance for the convenience of treatment and for the comfort of the patients. 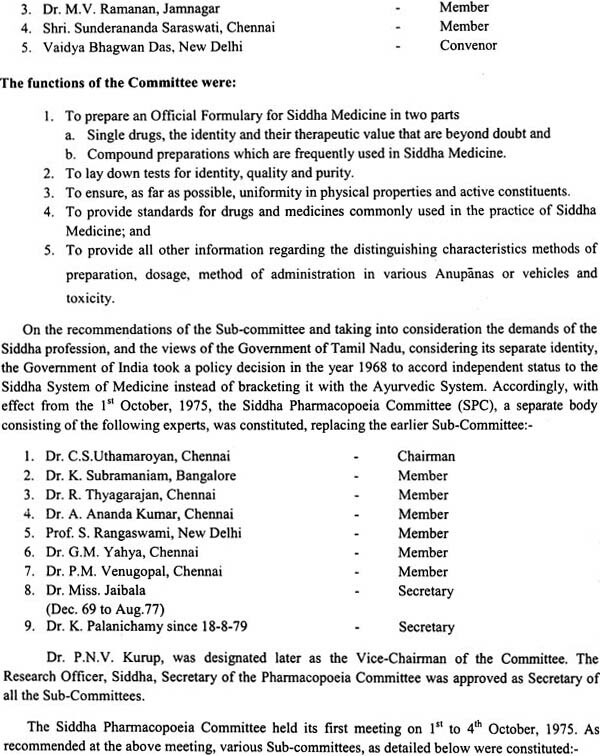 To bring global recognition to the Siddha system of medicine, the Government of India took up intelligent measures by the formation of a scientific committee styled Siddha Pharmacopoeia Committee in 1968 by acknowledging independent status from the level of a sub-committee functioning under Ayurvedic Pharmacopoeia Committee in February 1964. Then, Central Council for Research in Indian Medicine and Homoeopathy was established in 1969 for an integrated multi-disciplinary research and for clinical studies including drug standardization in Indian Medicine & Homoeopathy. This Council was bifurcated into 4 different councils for advanced research in 1978 and the research work in Ayurveda and Siddha was entrusted to the Central Council for Research in Ayurveda & Siddha. 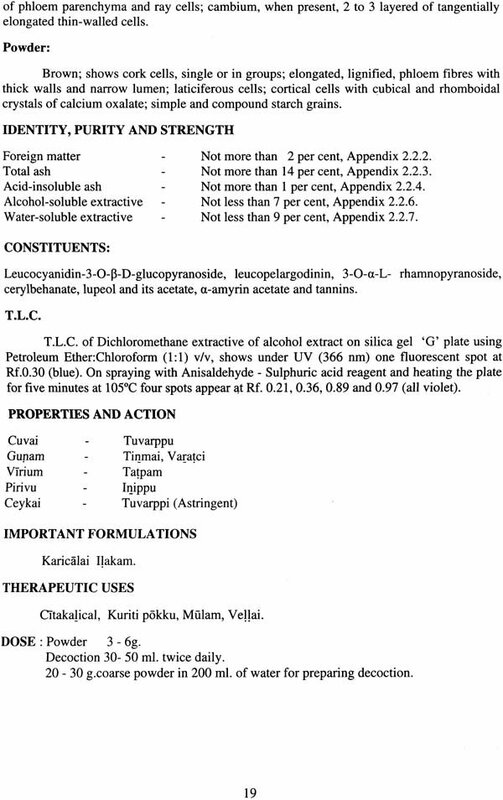 The Pharmacopoeial Laboratory for Indian Medicine (PLIM), at Ghaziabad was established in 1970 for testing and standardization of single drugs and compound formulations. 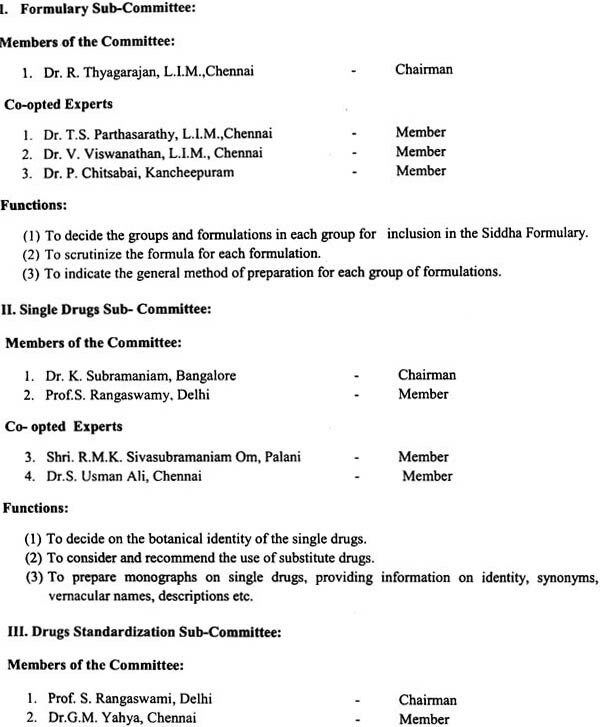 Under the auspices of the Central Council for Research in Ayurveda & Siddha several survey unit in different States were established for the work of standardization of single drugs and compound medicines. In addition clinical trials, clinical research, applied, fundamental research were also conceived as a routine work of this Council. 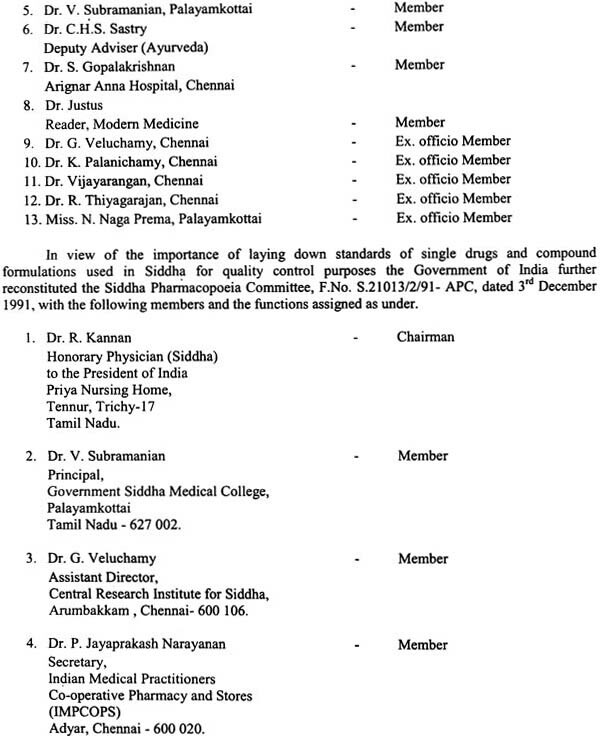 To keep up verifiable quality and standards for commercial preparations of Siddha medicines drug control measures were initiated by following Siddha Formulary of India and Siddha Pharmacopoeia of India. 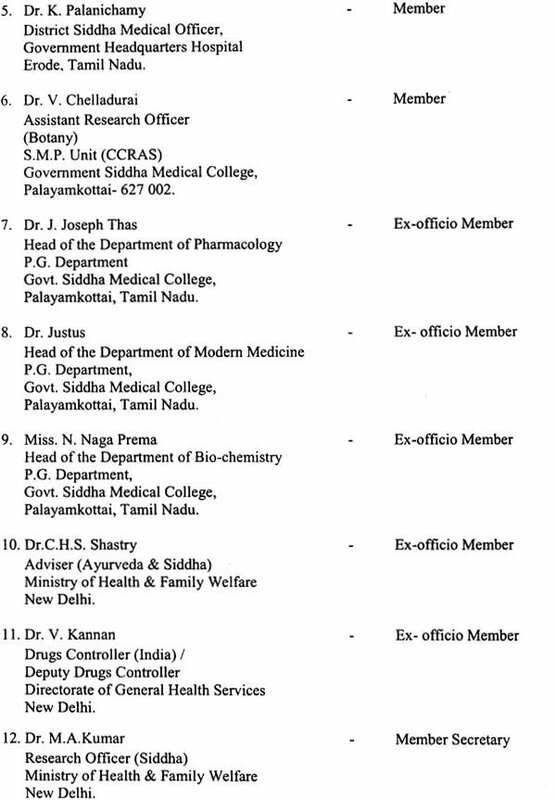 In the year 1975 a Siddha Pharmacopoeia Committee, a separate body was constituted under the Chairmanship of Dr. C. S. Uthamaroyan, which took over the work of compilation of Siddha formulary, which in turn served as a prerequisite for undertaking the work of Siddha Pharmacopoeia. 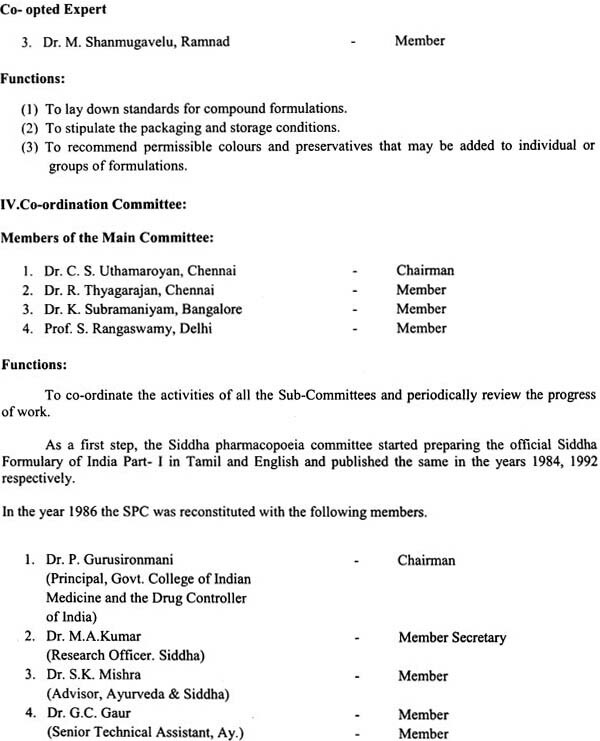 This committee published the first part of the Siddha Formulary of India in the year 1984 in Tamil and 1992 in English and Part-II of the Formulary is now under preparation. 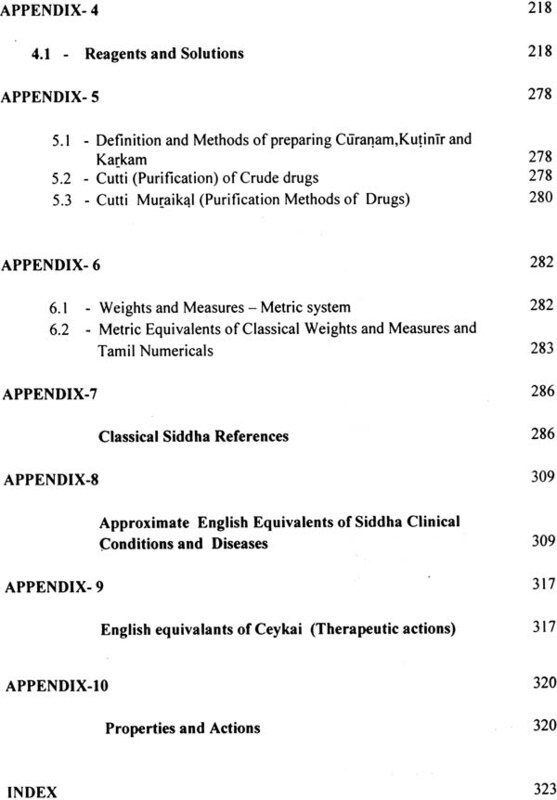 The first part of the Siddha Formulary of India comprises of 248 formulations covering more than 311 single drugs of plant origin, 93 drugs of metal and mineral origin and 48 drugs of animal origin. 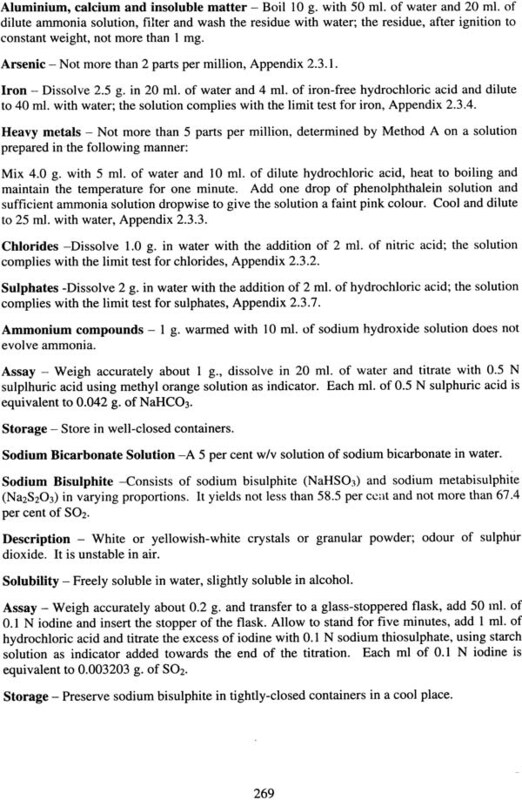 The Siddha Pharmacopoeia of India Part - I, Vol. 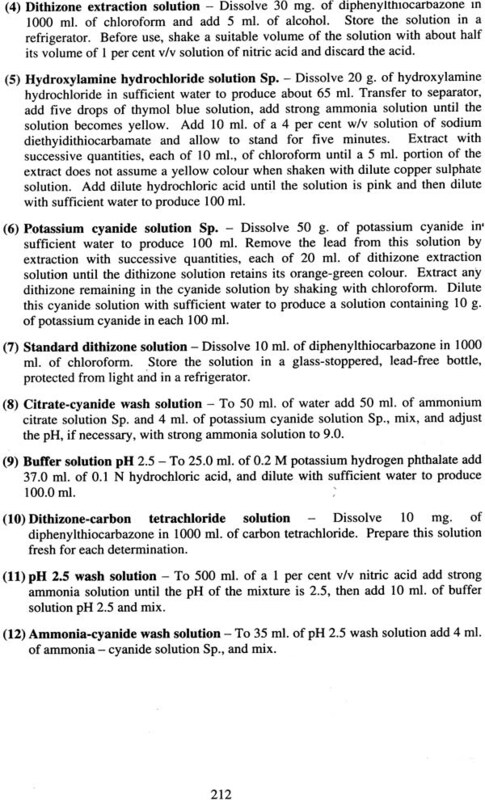 - I comprises of 73 monographs of Siddha single drugs of plant origin, which are included in one or more formulations enlisted in the Siddha Formulary of India Part - I. 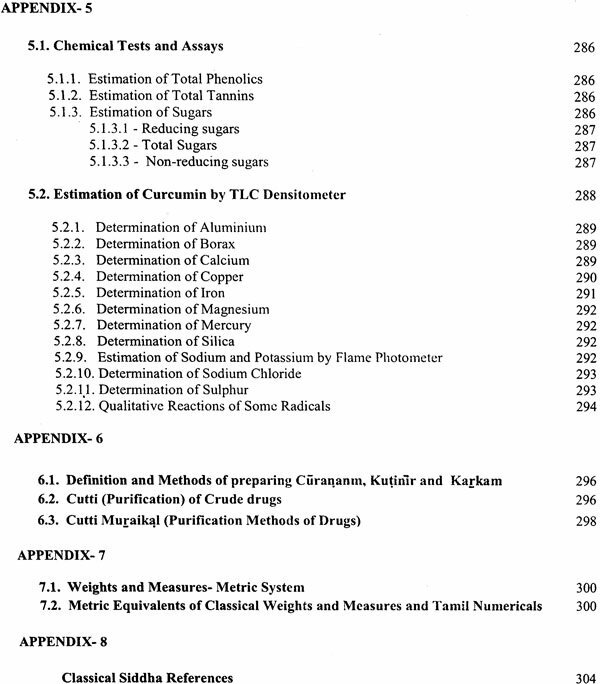 In compiling the monographs, the title of each drug had been provided in Tamilas mentioned in the Siddha Formulary of India, then comes the definition of the drug giving its identity in scientific nomenclature and very brief information about its source, occurrence, distribution and precautions in collection if any, etc. 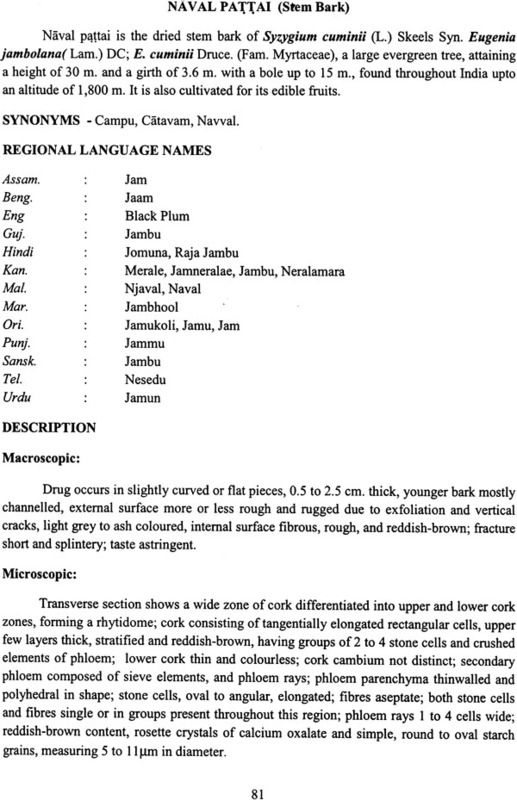 List of synonyms of drugs have been provided in Tamil and the other Indian regional languages. 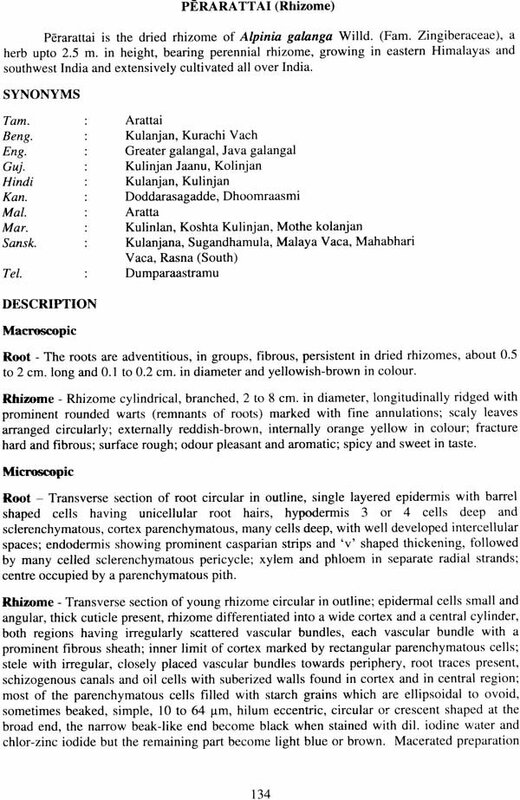 The monographs then record the detailed gross or macroscopic description of the drug and its microscopic tissue structure, the individual elements, deposition of crystals, starch grains, trichomes etc. 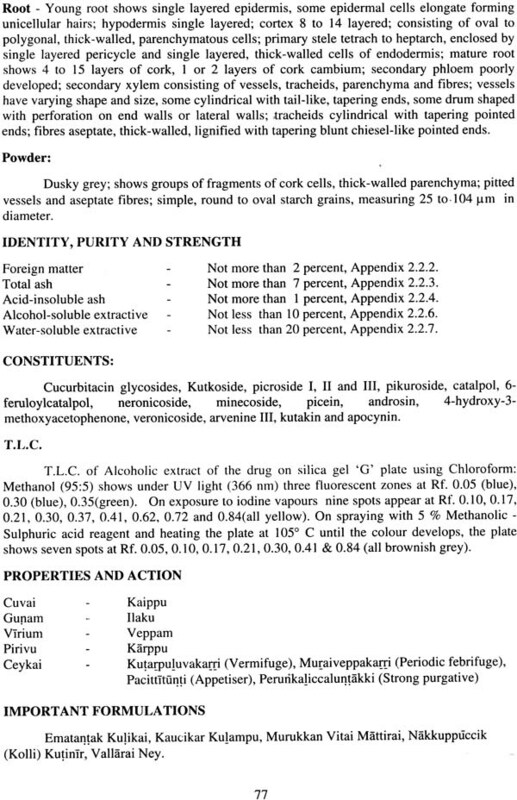 each having a pharmacognostic value in identification, especially when the drug is in powder form. 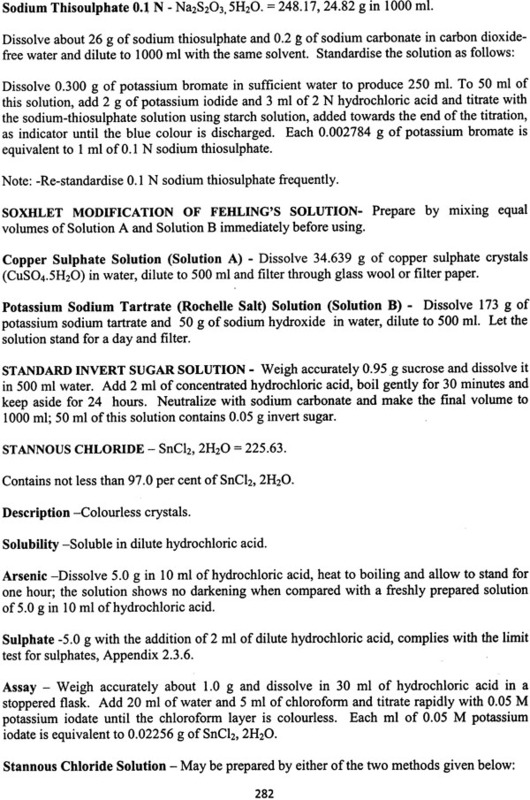 The monograph then gives norms and limits under 'Identify, Purity and Strength" like tolerance of foreign matter, total ash, acid insoluble extractive, water soluble extractive, volatile oil contents etc. 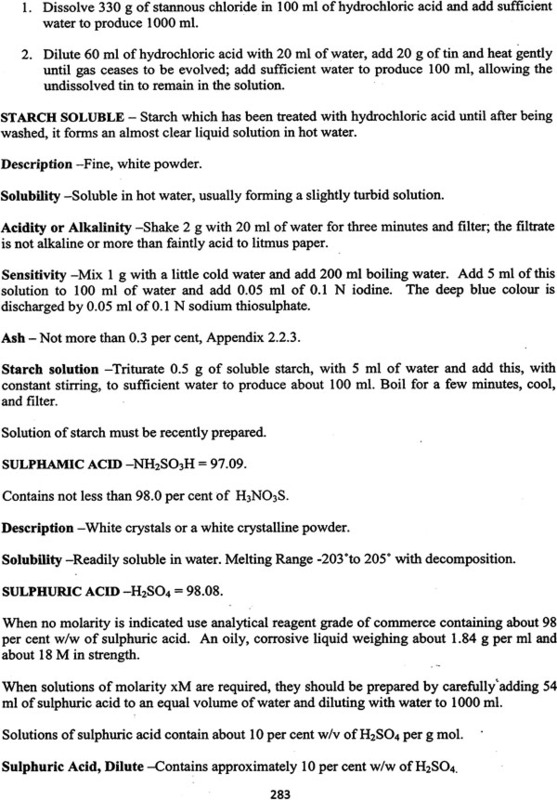 and thin layer chromatography (TLC). 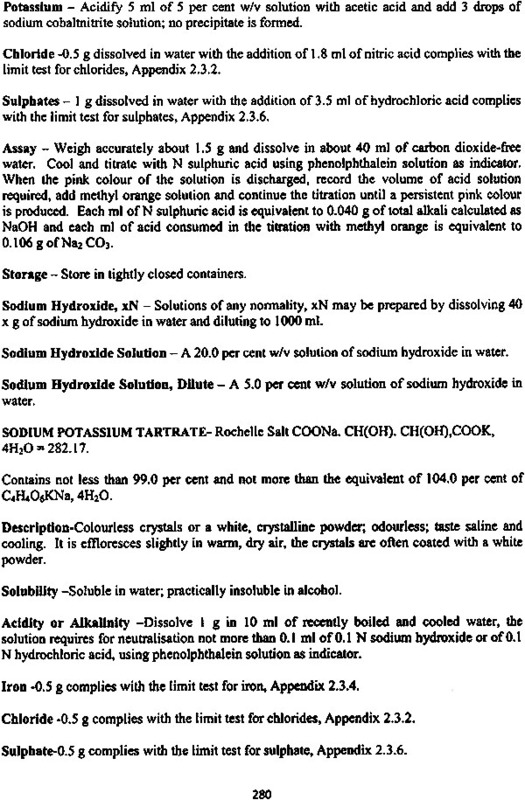 Some of them have a direct bearing on the purity and strength' while other enable to detect substitution or adulteration, if any. 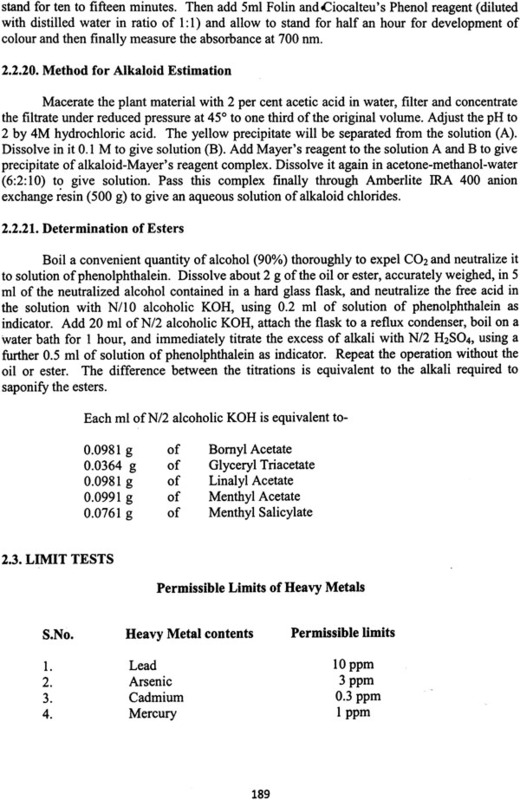 Assay has also been included wherever necessary. 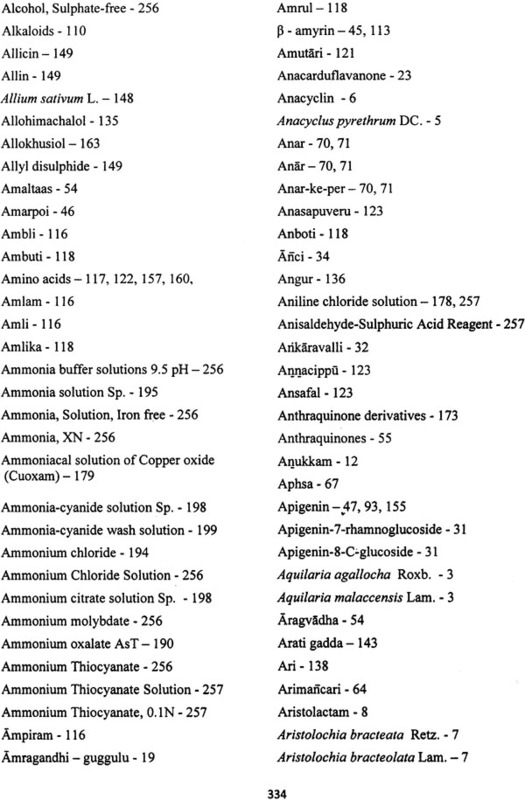 The names of important chemical constituents have been mentioned which only have an informative value based on published research work in Phytochemistry. 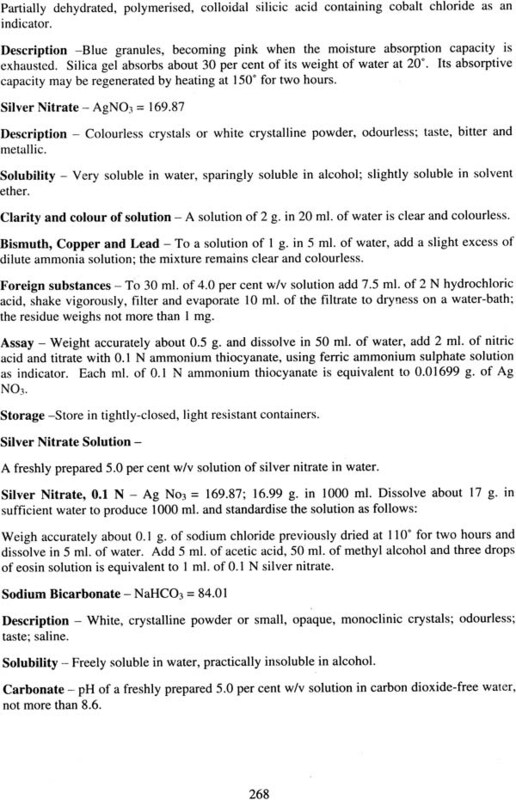 In the case of water-soluble or alcohol soluble extractives, specification of lower limit has an added relevance to the maturity of the drug in addition to its authenticity. 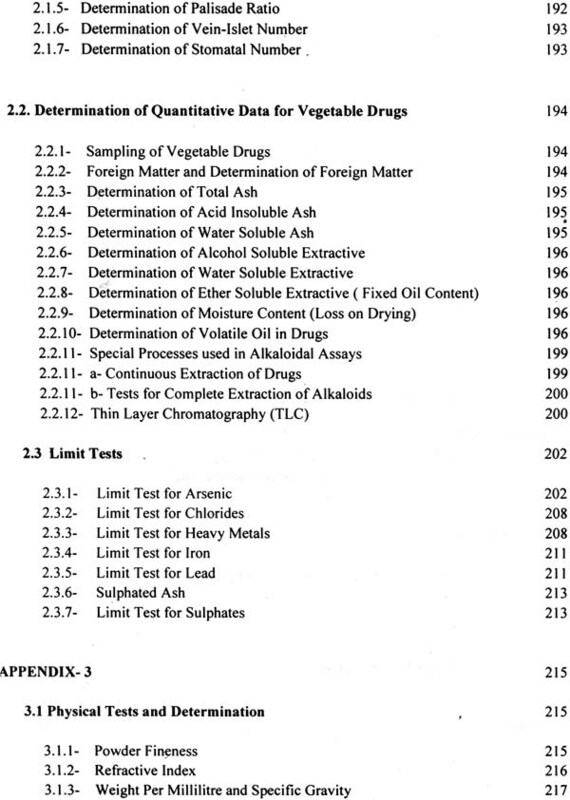 It will however, be worth mentioning that there is always a wide variation in crude drugs (raw materials) of plant origin in respect of their chemical contents, due to variations in climatic conditions, geographical distributions, source and season of collection and lack of scientific methods of preservation and storage.